Intercontinental Summit on Human Gene Editing and Human Genetic Engineering, 30 January 2019, Chulalongkorn University, Bangkok, Thailand. A Joint Event of American University of Sovereign Nations (AUSN) and Chulalongkorn University. Joint All India Association of Bioethics (AIBA)-AUSN Bioethics, Sustainability and Global Health Training Workshop, 8-10 December 2018, Chennai, Tamil Nadu, India. Partners included: Accredited Universities of Sovereign Nations, All India Association of Bioethics (AIBA), American University of Sovereign Nations (AUSN), Loyola ICAM College of Engineering and Technology (LICET), Saveetha Institute of Medical and Technical Sciences (SIMATS), ﻿ ﻿Madras University, Eubios Ethics Institute. ﻿﻿Nineteenth Asian Bioethics Conference (ABC19): Bioethics for Smart Living in Asia and Beyond: Taiwan as a hub for nurturing international partnerships and sustainable practices, 13-16 November 2018, Kaohsung and Pingtung, Taiwan. ﻿Joint Bangladesh Bioethics Society (BBS)-AUSN Bioethics and Academic Integrity Training Workshop, 3-5 August 2018, National Heart Foundation,Dhaka, Bangladesh﻿. AUSN-Chulalongkorn University Bioethics and Leadership Training Conference, 1 August 2018, Bangkok, Thailand. Joint USJR-AUSN Bioethics, Sustainability amd Public Health Workshop, 26 July 2018, ﻿University of San Jose-Recoletos (﻿USJR), Cebu, the Philippines. ﻿AUSN Bioethics, Sustainability and Global Public Health Conference, 17-19 July 2018, Yangon, Myanmar. Bioethics, Technology and Indigenous Peoples: Protecting our Health and the Environment for our Common Future, 14-15 April 2018, Tokyo and Yokohama, Japan. Joint AUSN-DGHS-BBS Intensive Bioethics and Research Ethics Workshop, 3-5 December 2017.﻿ Directorate General of Health Sciences (DGHS), Dhaka, Bangladesh. Joint AUSN-Gangneung-Wonju (GWNU) National University Bioethics Conference, 28-30 October 2017, Gangneung, Republic of Korea (Agenda, pdf file) Organisers: Gangneung-Wonju National University (GWNU), American University of Sovereign Nations (AUSN), Asian Bioethics Association, Eubios Ethics Institute, Youth’s UNESCO Club, Nepal in cooperation with the Korean Bioethics Association. AUSN Intensive Workshop on Bioethics for Global Peace, Southall, London, England, 24 September 2016. ﻿Ninth Kumamoto University - AUSN Bioethics Roundtable: Bioethics and Conflict Resolution: Dialogues for our Sustainable Future (KBRT9), 5 - 7 December 2015, Kumamoto, Japan. Draft agenda (pdf). ﻿Ethics and Public Health in the Americas and Asia, 28 November 2015, AUSN Arizona. 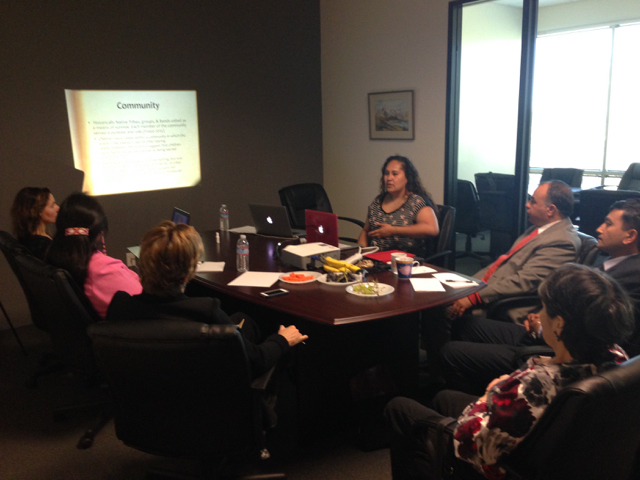 Joint Workshop of AUSN and ASU Lincoln Center of Ethics (agenda pdf). Part of the AUSN Intensive Bioethics and Public Health Training, 26-29 November 2015; AUSN Arizona, USA. ﻿The 16th Asian Bioethics Conference (ABC16) 3-8 November 2015, St. Paul’s University – Quezon City, Manila, the Philippines. Draft agenda The St. Paul University Quezon City and SPC Healthcare Ministry, the Asian Bioethics Association (ABA), Eubios Ethics institute and American University of Sovereign Nations (AUSN), organised the 16th Asian Bioethics Conference. This training also counted as credit for AUSN Certificates and Degrees, and five AUSN Masters Students had their public defense there. ﻿AUSN Youth, Bioethics, Peace and Community Leadership Training Workshop (and the Fifteenth Youth Peace Ambassador Training Workshop (YPA15)﻿﻿, 14-18 August 2018, Los Angeles, California and Arizona. ﻿Youth as Agents of Change and Resilience: ﻿13th Youth Peace Ambassador (YPA13) Training Workshop, Maritime Academy of Asia and the Pacific (MAAP), Bataan, the Philippines, 2-7 November 2016 (Agenda pdf ). 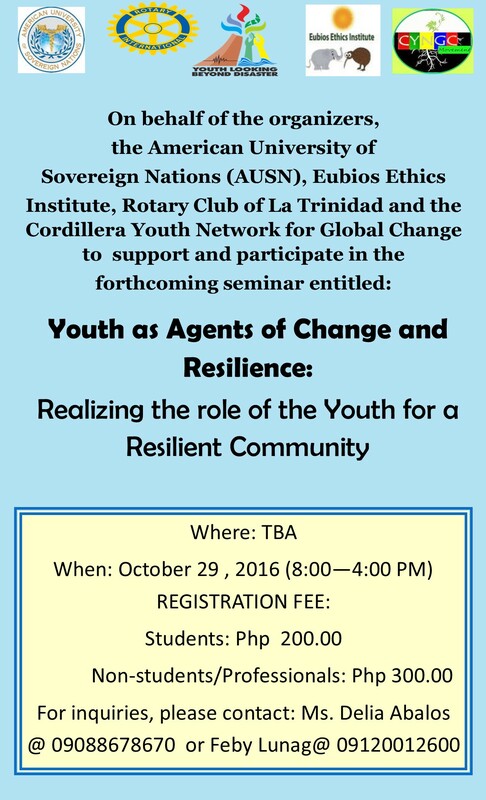 Youth as Agents of Change One Day event, Baguio City, the Philippines, 29 October 2016. jpeg file. Reconnecting with Nature and Community to Transform Ourselves and the World:﻿12th Youth Peace Ambassador (YPA12) Training Workshop (Part 2), AUSN, San Carlos, Arizona, 20-24 August 2016. ﻿Reconnecting with Nature and Community to Transform Ourselves and the World:﻿ 12th Youth Peace Ambassador (YPA12) Training Workshop, AUSN, San Carlos, Arizona, 23-27 July 2016. Draft agenda (pdf). 27-31 October 2015, Kathmandu, Nepal. Inquiries to lookingbd@gmail.com. www.eubios.info/conferences. This training also counted as credit for AUSN Certificates and Degrees. Training Workshop Faculty of Medicine Universitas Jenderal Soedirman (UNSOED), Purwokerto, Indonesia, 20-24 May 2015 AND Peace Generation Indonesia (PeaceGen), Bandung, Indonesia, 24-25 May 2015 Also held with the AUSN-UNSOED Intensive Bioethics and Ability Studies Course, Purwokerto, Indonesia, 18-20 May 2015. This training counted as 3 credit hours for the MBGPH or MPH Combination (Hybrid) degree, and one of three required residential Intensive Training Programs to graduate from the MBGPH or MPH programs. Dialogue Methodology for Social Change, United Nations University, Tokyo, Japan, 6-8 May 2015. Investigation in Bioethics (IIB), Monterrey, Mexico, 20-25 April 2015. This training counted as 3 credit hours for the MBGPH or MPH Combination (Hybrid) degree, and one of three required residential Intensive Training Programs to graduate from the MBGPH or MPH programs. Held in cooperation with the Universidad del Desarrollo. AUSN, Scottsdale, Arizona, USA, 29 January – 7 February 2015. Beppu, Nagasaki, Kumamoto, Japan, 1-9 November 2014, Details on www.eubios.info/conferences. University Gadjah Mada (UGM), Yogyakarta, Indonesia, 3-8 September, 2014. The action plans and agenda is on http://www.eubios.info/youth_looking_beyond_disaster_lbd/lbd5_in_yogyakarta_sept_2014. AUSN, Scottsdale, Arizona, USA, 21-28 August 2014. 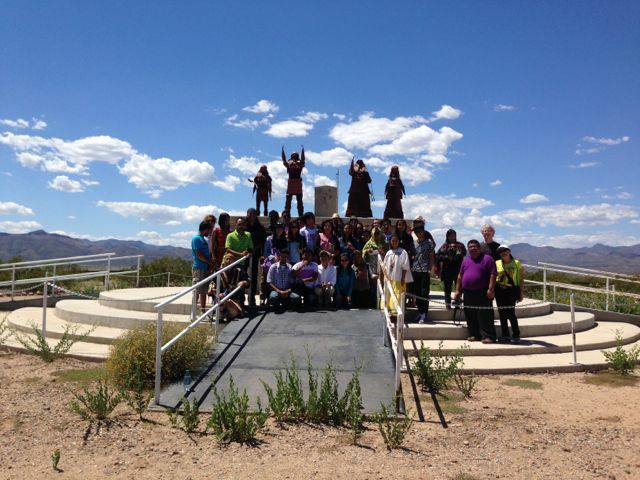 Native American communities in the AU-Authum News and the Navajo Times. 28 June 2014 (9:00-18:00) UNAM University Cultural Center in Tlatelolco, Mexico City, Mexico Agenda and Conference Report. Kathmandu and Lumbini, Nepal 19-25 January 2014. Call for participation (pdf) and registration form (Word) on www.eubios.info/conferences. will be hosted by St. Paul’s University, Manila, Philippines (27-31 March 2014). 9th November, 2013, 10am–3pm, Norwood Hall, Norwood Green Rd, Southall, UB2 4LA, England. Call for participation (pdf) on www.eubios.info/conferences. The 14th Asian Bioethics Conference – The 14th conference of the Asian Bioethics Association (ABA). With cooperation between University of Hyogo and Eubios Ethics Institute who organized LBD2. Also in cooperation with American University of Sovereign Nations. 25 May – 2 June, 2013, Bangkok and Kaeng Krachan, Thailand.